View More In Fashion Hoodies & Sweatshirts. 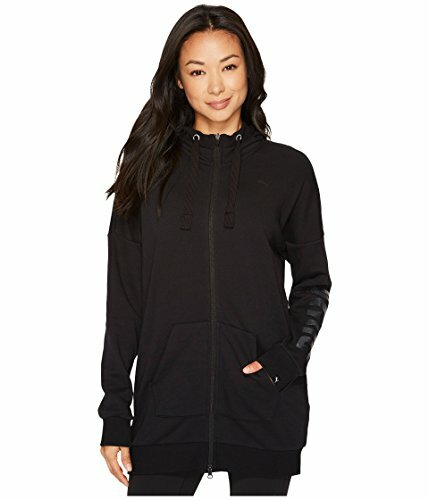 PUMA Size Guide Mix it up in this PUMA® Fusion Hoodie, where comfort and style meet. PUMA® Lifestyle apparel marries the essence of sports performance with the refined finishes and detailing of the fashion industry. Ribbed accents trim hood, cuffs and hem. Attached hood with drawstring ties. Long sleeves with banded cuffs and dropped shoulder seam. Two-way front zipper closure. Split hand pockets at front. Elongated banded hem adds more coverage and keeps you warm. Brand mark logo runs down sleeves. 68% cotton, 32% polyester. Imported. Machine wash, hang dry. Measurements: Length: 31 in Product measurements were taken using size SM. Please note that measurements may vary by size. Mix it up in this PUMA® Fusion Hoodie, where comfort and style meet. PUMA® Lifestyle apparel marries the essence of sports performance with the refined finishes and detailing of the fashion industry. Ribbed accents trim hood, cuffs and hem. Attached hood with drawstring ties. Long sleeves with banded cuffs and dropped shoulder seam. Two-way front zipper closure. Split hand pockets at front. Elongated banded hem adds more coverage and keeps you warm. Brand mark logo runs down sleeves. 68% cotton, 32% polyester. Imported. Machine wash, hang dry. Measurements: Length: 31 in Product measurements were taken using size SM. Please note that measurements may vary by size. If you have any questions about this product by PUMA, contact us by completing and submitting the form below. If you are looking for a specif part number, please include it with your message.